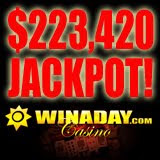 WinADay.com has just had its biggest progressive jackpot winner ever! A retired widower won $223,420 last week when he was playing the new Reel De Luxe online slot machine. WinADay.com is an unusual online casino with a most extraordinary suite of whimsical, one-of-a-kind slot machines and video poker games. This is the eighth six-figure jackpot at the unique online casino since it launched. Although the jackpots have averaged about $150,000 there was a nearly $200,000 winner at Christmas. There’s no predicting when a major jackpot will be won, but at WinADay.com it happens, on average, about every six weeks. The jackpot has been re-set and is already over $80,000. “I know some jackpots get much bigger, but I don’t think there are any others that are hit for this much money this often,” said Michael Hilary of WinADay.com. The Reel De Luxe is an easy-to-play 5 reel, 25 payline slot machine with a luxurious shopping theme, wild symbols, 2 special bonus features and a bonus game. Its “Present Bonus” feature awards up to 500x the bet and there’s also a special Cash Bonus Game with prizes up to $1500. For shoppers that look for the best deals around there’s a “Discount Bonus” - a discount from total bets on 3 spins up to 100%. Constantly adding outlandishly designed new games to its collection of custom slot machines and video poker games, WinADay.com recently launched Leprechaun Luck, a 5-reel, 31-payline game with Wild and Double Wild symbols and bonus games. Another new game will be announced later this month. Unlike the cookie-cutter games at most online casinos, WinADay’s 13 fancifully-designed games -- nine unique slot machines tied to one progressive jackpot, and four video poker games -- are not available at any other casino. All instant play, no download games, they can only be found at WinADay.com. View a video version of this story.